My running journey began 20 years ago when I joined my high school’s cross country and track team. Ever since, my love for running flourished and became a significant part of my life. However, it wasn’t until 2005 when I started running longer distances after being convinced by a friend to sign-up for a marathon. Unfortunately, my training was sub-par which resulted in a long and painful run/jog/walk to the finish line. I swore I would never run a marathon again! After running several half marathons and other short distance races, I was convinced yet again by another friend (I have awesome running friends!) to sign up for a marathon in 2008. I was smart enough this time to join a marathon training program (SDTC Rockin n Runnin). I consistently followed the training plan and became educated about every facet of running a marathon. I was amazed at my transformation of drastically improving my pace which led me to my fastest to date finish time and qualified for Boston! Qualifying for Boston was not even a consideration when I started the training program. The following year, in 2009, I crossed the finish line in Boston exhilarated – it was my best running experience by far. 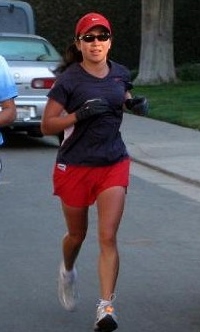 2009 was definitely my best running year. Fast forward to the present, I now have two beautiful sweethearts to care for, so my focus shifted to my family. Time passes by rather quickly and my “babies” are no longer babies allowing me more time to participate in races. I’m not quite sure if there are any PRs left in me but I’m searching and trying different paths to strengthen my body/mind and reduce nagging injuries to improve and continue to run for as long as I can. myRUNresults – Displays my latest race results. myRUNinspirations – About people, ideas, workouts, everything and anything that makes me a better runner. Nice to meet you Elaine! Love your blog and your running results are very impressive! Thanks Ilka! Happy to link up with you.